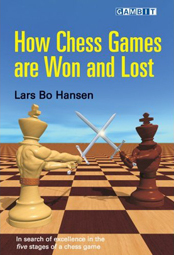 As the author states in the introduction, “this is a book about chess improvement.” In it he reveals the lessons he learned during his own development process “from young talent to seasoned grandmaster.” Hansen shares his insights into self-training, the pitfalls to avoid, and the reasons for successes and failures. The material is divided into six sections: the opening, transition from opening to middlegame, the middlegame, transition from middlegame to endgame, technical endgames, and practical tips. The first five sections correspond to the author’s definition of the five phases of a chess game. Hansen warns about spending too much time studying any one phase of the game and notes that young players are especially prone to focusing too much on the opening. He writes that “until you reach perhaps 2300-2400 in rating, the games are rarely decided in the opening.” He also acknowledges that “hard work is a prerequisite for developing talent to its fullest potential.” So if you are willing to put in the work, you will be amply rewarded by reading this book.